The Rufous-tailed Weaver was formally described by Anton Reichenow, a German ornithologist and herpetologist. 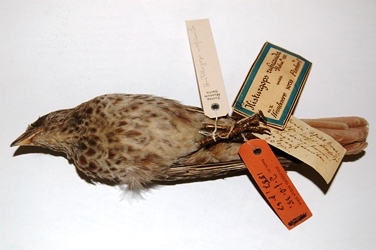 The Rufous-tailed Weaver was collected by Dr Gustav A Fischer, a German African explorer. Fischer settled as a physician in Zanzibar in 1876, from where he undertook expeditions to Tanzania and Kenya. Fischer collected some birds in Zanzibar and then undertook a trip along the Kenyan coast where he collected some Fire-fronted Bishops. His third trip started in late 1882 on the Tanzanian coast and he followed the Pangani River upstream. When he reached the Pare Mountains in March 1883, he collected the type specimen of the Black-capped Social Weaver. Fischer visited Europe and then returned to Tanzania in 1885. On 1 August 1885 he left Pangani and travelled south to Irangi and then northwards towards Lake Victoria. On 24 October 1885 he found Rufous-tailed Weavers on the Wembere Steppe at the southern edge of the range of this species. Fischer briefly described the nests and habits of this weaver. 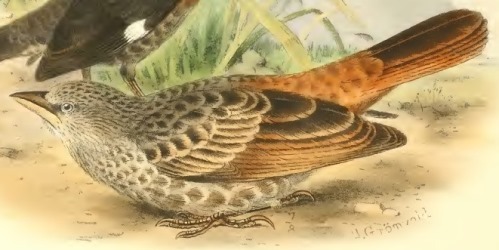 The first illustration of the Rufous-tailed Weaver was a line drawing of the head published by Sharpe (1890). The next illustration to be published was a colour painting of an adult Rufous-tailed Weaver in Shelley (1905). 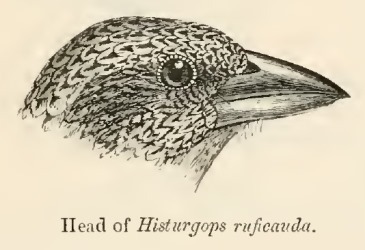 Histurgops ruficauda	Reichenow 1887,	Journ. f. 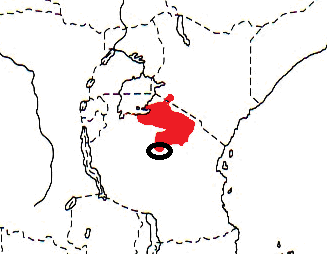 Orn., 35, p.67,	Wembere Steppe, central Tanganyika Territory. ruficauda, Latin: rufus, red; cauda, the tail. There is a type in the Berlin Museum. Identification. The Rufous-tailed Weaver is grey-brown with a scaly and mottled head and body and rufous tail and wing-patch. Sexes are similar. The eye colour is unique among weavers in being bluish-white (but brown in juveniles). The Rufous-tailed Weaver is in the monotypic genus Histurgops. The meaning of Histurgeo is "to weave (i.e. a weaver bird)" and ops means "face" so the genus name means weaver-faced! (or appearance of a weaver). Distribution. The distribution map (below) is based on Birds of Africa, shows the restricted range of the Rufous-tailed Weaver in northern Tanzania (purple). However, on 4 July 2000 Dave Richards recorded a group of 5 birds in the Maasai Mara in Kenya, near the border. More records followed from 2007 onwards and the first breeding record in Kenya was recorded by Colin Jackson, as a colony of 7 nests, with chicks, on 14 April 2010. The Kenyan records are shown in green. No subspecies have been described for this species. Habitat. 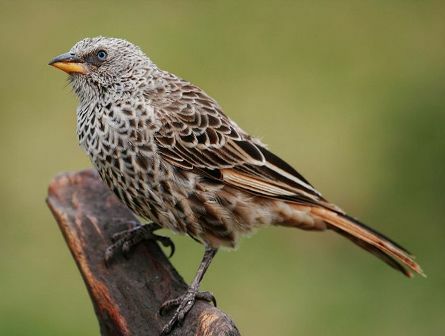 The Rufous-tailed Weaver inhabits savanna thornveld, especially on black cotton soils. Food. The Rufous-tailed Weaver forages on the ground, feeding on seeds, insects and fruit. The birds run on the ground, their legs being longer than those of mostly arboreal weavers, and flocks also make short flights low across the ground while feeding. They often associate with starlings or buffalo-weavers. They are tame and confiding around some national parks and lodges, where they may beg for food. Breeding. The Rufous-tailed Weaver is monogamous and colonial, with up to 30 nests per tree. They are resident at their nesting colonies and continue building all year. The nest is a ball of grass with a short, wide entrance spout. Initially the nest has two openings with one being closed when eggs are laid, as happens in White-browed Sparrow-weavers. Gall acacias are preferred as nest sites, with nests usually placed 1.5-4 m above the ground. Although common within its range, incubation and nestling periods are not known for this species. The eggs may rest in the nest with no lining, or some feathers may be used to line the nest. The eggs (clutch 2-3) are pale blue, with grey and brown markings. Nests may be used for breeding by Superb Starlings, and for roosting by Fischer's Lovebirds.